Transitional Design Condo Update in San Francisco, California Pacific Heights Neighborhood The owners of this condo in Pacific Heights wanted to update their 60’s style kitchen and bathrooms yet strike a balance between ultra modern and conservative. 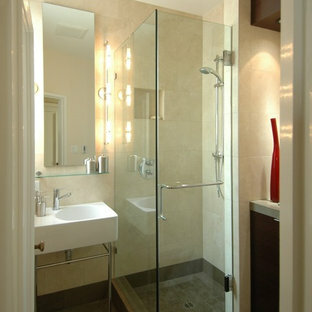 To achieve this, we combined clean modern lines and contemporary fittings with warm natural stone and rich woods. In the kitchen, a distinctive effect is achieved by using quarter sawn cherry veneer on the shaker style cabinet doors with parallel grain run horizontally. Beautiful brown granite and custom stain compliment the oak floors we selected to provide continuity with the rest of the house. The master bath features a vanity designed with a wrap-over counter of thick granite, wenge wood veneers, Venetian plaster and a carefully coordinated variety of glass and stone tiles. 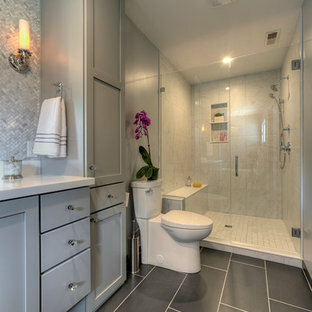 In the guest bath a similar material palette is enlivened by inclusion of a wall hung toilet and an art niche. We used a co-ordinating brick effect feature tile on the walls in the shower enclosure. Stone tilling creates a luxury spa bathroom retreat for the homeowners. A beautiful focal wall using geometric patterns allows this shower to take center stage in this gorgeous design. For the bathroom tile, the clients chose our Barcelona La Merced Quarter 6"x6" tiles to create a bright Mediterranean shower. The coordinating blue trim ties in the tiles from the bathroom into the shower. 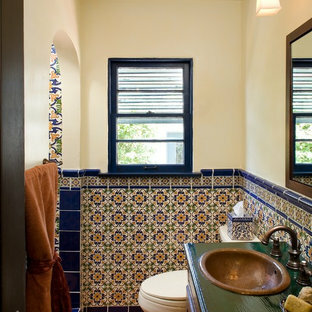 Also used in the bathroom were our Barcelona La Merced 6"x6" tiles for the entire lower half of this bathroom wall. Smaller La Merced 3"x3" tiles create a lovely border along the top. Coordinating blue cornice and liner tiles add a nice contrast along the edges of the decorative tiles. Our Yucatan Ceramic Field Tile collection, and its extensive molding and trim options, were used for this bathroom’s backsplash. 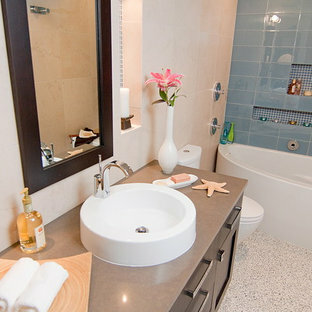 This small guest bathroom in a condo on the beach desperately needed a complete overhaul. We took it to the studs. The space was long and narrow and problematic to begin with having only 7 ft ceilings. And, of course the client wanted a rain head! Yikes! To accomodate this need we recessed the rainhead in a ceiling “niche” of sorts and tiled it with the coordinating mosaic glass we used in other niches in the room. The client also requested a tub...and shower..but wanted us to be creative in finding the right one. The Neptune “Wind” tub fit the need perfectly. The challenge was how to hang a shower curtain as well as how to mount a tub filler...we used a kohler laminar spout coming from wall so it looks great as well as functioning just as we needed. The shower curtain dilemma is solved by using an old fashioned 25 dollar clothesline. It stretches out from one end to the other and the curtain hangs on it when needed. Day to day the tub shines as the star! The client also requested a kitty litter box cut into one side of the cabinet so we made the cabinetry look the same from front but on side next to toilet is a small cutout for kitty to enter and exit. The door opens to easily clean the box. The candle niches were cut into the back wall of tile to give some visual texture to the room. The flooring is 12x12 terrazzo tiles that work perfectly off the blue glass 6x12 tile on the back wall. The other walls are limestone. The countertops are blue lagos Ceasarstone. 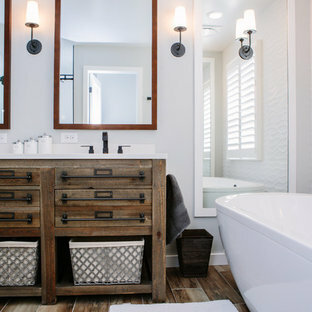 All in all, this bath really packs a powerful punch in a small space! This master bathroom renovation transforms a builder-grade standard into a personalized retreat for our lovely Stapleton clients. Recognizing a need for change, our clients called on us to help develop a space that would capture their aesthetic loves and foster relaxation. Our design focused on establishing an airy and grounded feel by pairing various shades of white, natural wood, and dynamic textures. We replaced the existing ceramic floor tile with wood-look porcelain tile for a warm and inviting look throughout the space. 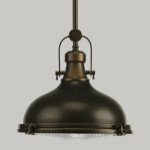 We then paired this with a reclaimed apothecary vanity from Restoration Hardware. This vanity is coupled with a bright Caesarstone countertop and warm bronze faucets from Delta to create a strikingly handsome balance. 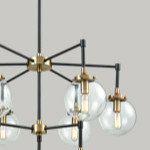 The vanity mirrors are custom-sized and trimmed with a coordinating bronze frame. 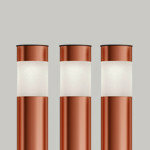 Elegant wall sconces dance between the dark vanity mirrors and bright white full height mirrors flanking the bathtub. The tub itself is an oversized freestanding bathtub paired with a tall bronze tub filler. We've created a feature wall with Tile Bar's Billowy Clouds ceramic tile floor to ceiling behind the tub. The wave-like movement of the tiles offers a dramatic texture in a pure white field. 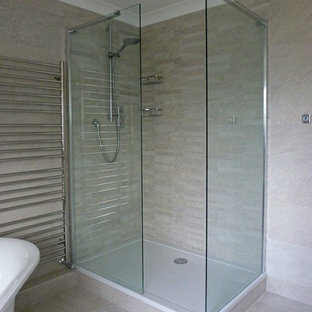 We removed the existing shower and extended its depth to create a large new shower. The walls are tiled with a large format high gloss white tile. The shower floor is tiled with marble circles in varying sizes that offer a playful aesthetic in an otherwise minimalist space. We love this pure, airy retreat and are thrilled that our clients get to enjoy it for many years to come! 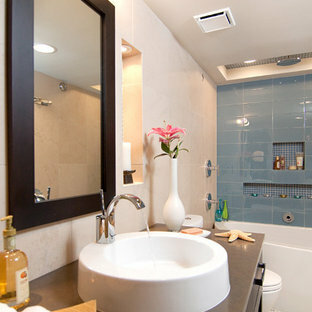 This sleek bathroom creates a serene and bright feeling by keeping things simple. 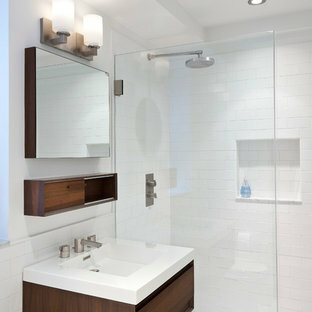 The Wetstyle floating vanity is paired with matching wall cabinet and medicine for a simple unified focal point. Simple white subway tiles and trim are paired with Carrara marble mosaic floors for a bright timeless look. 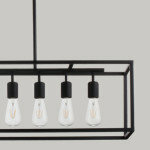 By Clifford M. Scholz Architects Inc.
By One Week Bath, Inc.